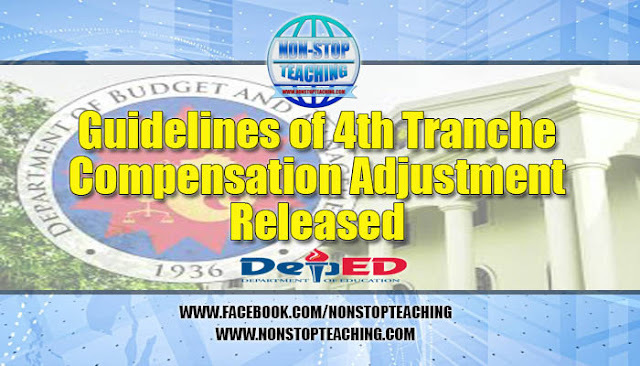 On Monday, March 25, the Department of Budget and Management (DBM) released the guidelines, rules and regulations for the implementation of the fourth tranche compensation adjustment in 2019 with the issuance of National Budget Circular No. 575, pursuant to Executive Order No. 201, s. 2016, as amended by Executive Order No. 76, s. 2019, which takes effect retroactively starting January 1, 2019. The Circular covers all positions for civilian personnel, whether regular, casual, or contractual in nature, appointive, or elective, full-time or part-time, now existing or hereafter created in the Executive, Legislative, and Judicial branches, the Constitutional Commissions and other Constitutional Officers, and State Universities and Colleges. Those engaged without employer-employee relationship and with salaries funded from the non-Personnel Services appropriations of agencies are, however, excluded from in the coverage of the Circular. The compensation adjustment shall be charged against any available appropriations under the FY 2018 General Appropriations Act, as reenacted for 2019. The Circular also includes rules on the adjustment of salaries; the granting of the Mid-year Bonus, the Productivity Enhancement Incentive, and the Performance-based Bonus. The procedural guidelines and the responsibilities of agencies with regard to the compensation hike are also outlined in the circular. The issuance of Executive Order No. 76, s. 2019 and National Budget Circular No. 575 authorized agencies and constitutional offices to implement the 4th tranche of the compensation adjustment, pending the passage of the FY 2019 General Appropriations Act. The series of compensation adjustments, with the fourth tranche being implemented in 2019, seeks to provide equitable compensation to government employees for their work.